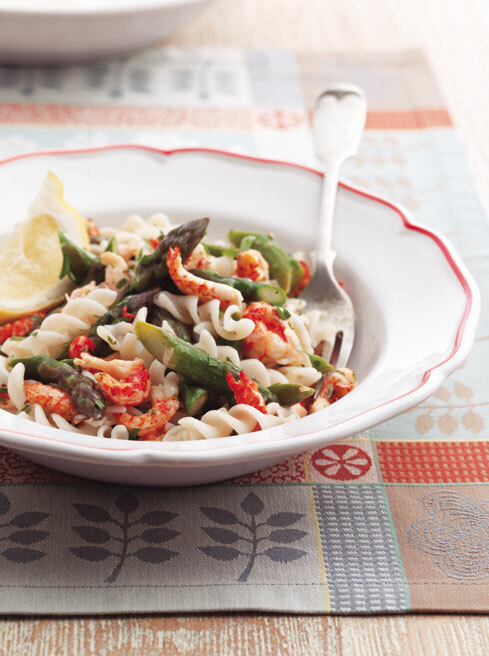 The asparagus season has officially started here – yay! (You can get organic asparagus now from Riverford Organic Vegetables.) 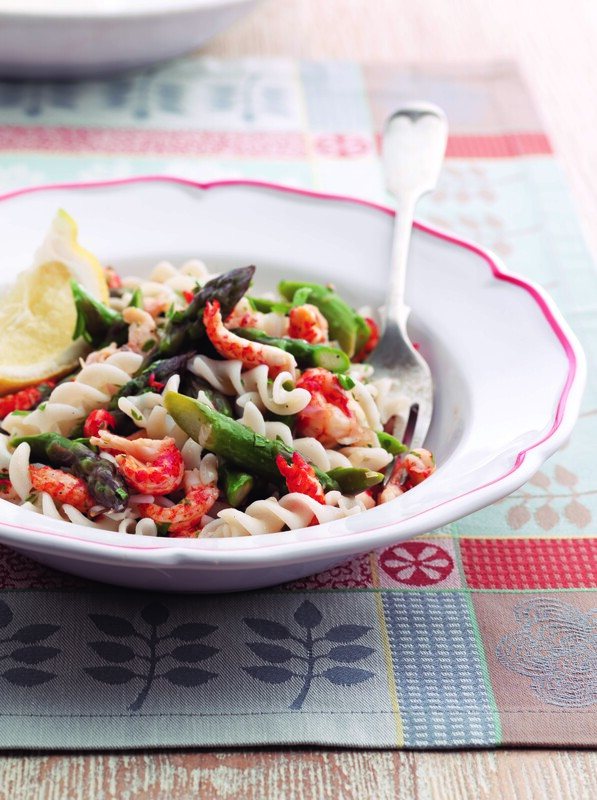 This recipe is one of Peter’s (hubby’s) favourites – he loves the clean sharp tastes of the chilli and lemon combined with the herbs and seafood (he is Australian, so no surprises there). Gluten-free pasta needs more liquid in the sauce than traditional kinds, so I’ve added fish stock, lemon juice and olive oil. It’s still a fairly minimalist sauce, but enough liquid and flavours to work well with the pasta. You could use other types of seafood such as cooked prawns, crab or squid, and you could use different herbs, too, such as coriander or mint. And if you have home-made fish stock, it will add a delicious depth of the flavours. This recipe from my new book, Simply Gluten-Free & Dairy-Free is so super-easy – just perfect for a holiday weekend like this one, when you want to enjoy gorgeous food without any hassle. Happy Easter! Put the shallots, chilli, garlic and lemon zest in a mini food processor or spice mill and blend until finely chopped, making sure the zest is coarsely chopped. Bring a large saucepan of water to the boil and stir in 1 tablespoon of the oil. Add the pasta and cook over a medium heat for 8–10 minutes, or according to the instructions on the packet, until soft. Make sure you stir occasionally to ensure the pasta doesn’t stick. Drain and rinse well with freshly boiled water, then drain again. Meanwhile, in a large, heavy-bottomed saucepan, heat 4 tablespoons of the remaining oil over a medium heat. Add the shallot mixture and fry, stirring, for about 1 minute until starting to turn golden. Add the asparagus and stir well. Fry for another minute, then add the fish stock. Cook, covered, for 4 minutes, then add the crayfish. Cook for another 2 minutes until the asparagus is tender but still slightly crunchy. Add the cooked pasta to the saucepan and mix well. Add the parsley, lemon juice and the remaining 2 tablespoons of olive oil. Season with salt and pepper and serve immediately with lemon quarters for squeezing over. 1 To make the biscuits, preheat the oven to 180°C/350°F/gas 4 and line two baking sheets with baking parchment. Put the dairy-free margarine and sugar in a saucepan and heat over a low heat until the margarine has melted and the sugar has dissolved. Bring to the boil over a high heat, then turn the heat down to medium-low and simmer for 4–5 minutes until the mixture has caramelized slightly and become syrupy. 2 Sift the flours into a large mixing bowl and stir in the ground ginger, gluten-free baking powder and xanthan gum. Add the root ginger and, using your fingertips, rub it into the flour mixture until well mixed. Add the margarine and sugar syrup, and stir well with a wooden spoon. 3 Spoon the mixture, 1 tablespoon at a time, onto the baking sheets. Using your hands and the back of a metal spoon, shape each mound into a round biscuit shape about 3mm/1∕₈in thick. 4 Bake for 8–12 minutes until lightly browned. Remove from the oven and leave to cool for 5 minutes, then transfer to a wire rack and leave to cool. Break into pieces. 5 Preheat the oven to 180°C/350°F/gas 4. Lightly grease a deep 20cm/8in springform cake tin with dairy-free margarine and line the base with baking parchment. Heat the dairy-free margarine in a saucepan over a low heat until melted. Put the biscuits in a food processor and blend until the mixture resembles fine breadcrumbs. Add the crumbs to the melted margarine and mix well. Using the back of a spoon, press the mixture evenly into the base of the cake tin. Cover with the blueberries and leave to chill in the fridge for 10 minutes. 6 Meanwhile, blend the soya cream cheese, sugar, and lime zest and juice together in a food processor until smooth. Add the eggs and blend until smooth and creamy. 7 Pour the cheese mixture over the blueberries and bake for 30–35 minutes until pale golden brown and the top feels firm to the touch. Turn the oven off and leave the cheesecake to rest in the oven for another 30 minutes. 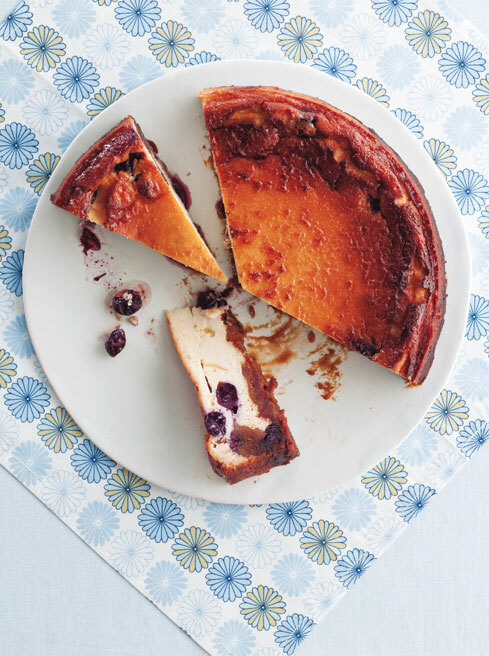 8 Ease the cheesecake out of the tin and leave to cool completely, then chill in the fridge for 3–4 hours until completely set before serving. These gluten-free cupcakes are truly indulgent and heavenly! The mixture is incredibly simple – just a combination of rice flour and ground almonds, along with the dairy-free margarine, sugar, eggs, gluten-free baking powder and xanthan gum. I think you have to be careful when you use ground almonds in baking – that you don’t use too much because I find they dominate and leave a slightly sticky taste at the back of your mouth otherwise. Here I’ve balanced the ground almonds with the same amount of rice flour and then I’ve added raspberries to the mixture – and these add moistness and texture, as well as a lovely berry taste. And then I’ve made a rosewater frosting with soya cream cheese. This is the image used on the cover of my new book, Simply Gluten-Free & Dairy-Free – and I think these cupcakes sum up the book – incredibly simple to make and truly delicious. Preheat the oven to 180°C/350°F/gas 4 and arrange 12 paper cupcake cases in a bun tin. To make the frosting, put the dairy-free margarine, soya cream cheese and rosewater in a mixing bowl and beat, using a whisk or hand-held electric mixer, until smooth. Add the sugar, a little at a time, and beat until light and fluffy. Cover and chill in the fridge for 30 minutes. Using an electric mixer, beat the dairy-free margarine and sugar together in a large mixing bowl until light and fluffy. Gradually beat in the eggs, one at a time, until well mixed. Sift the rice flour, gluten-free baking powder and xanthan gum into the mixture. Quickly fold in the ground almonds, using a spoon, then gently fold in the raspberries. Mix well, but take care not to overmix. Divide the mixture evenly into the cupcake cases. Bake for 18–20 minutes, until golden brown and well risen and a skewer inserted in the centre comes out clean. Remove from the oven and turn out of the tin, then transfer to a wire rack and leave to cool completely. 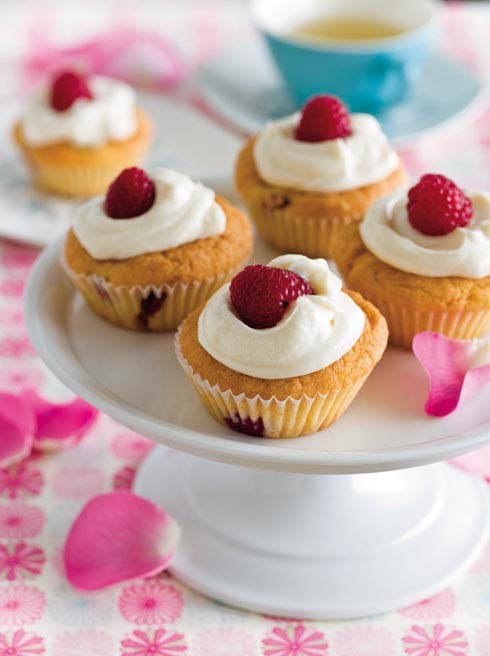 Spread a little of the frosting over each cupcake, top with a raspberry and serve. 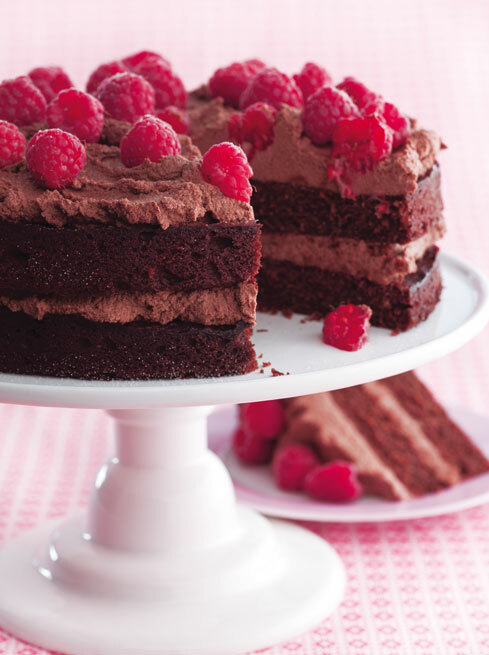 Here’s the Chocolate Birthday Cake recipe from my new book, Simply Gluten-Free & Dairy-Free published today! This was inspired by one my sister made for her husband’s birthday. It’s light and moist, with dark truffley chocolate flavours and a rich, creamy icing, all covered with sweetly sharp raspberries. Happy Birthday to my book! Put the nuts in a bowl, cover with cold water and leave to soak at room temperature overnight or for at least 12 hours. Drain and rinse the nuts thoroughly, then put them in a blender. Add the vanilla extract and dates and pour in 250ml/9fl oz/1 cup water. Blend for 10 minutes or until smooth. Preheat the oven to 180°C/350°F/gas 4 and lightly grease two 23cm/9in springform cake tins with dairy-free margarine. Put the chocolate in a large heatproof bowl and rest it over a pan of gently simmering water, making sure that the bottom of the bowl does not touch the water. Heat, stirring occasionally, until the chocolate has melted. Using an electric mixer, beat the dairy-free margarine and sugar together in a large mixing bowl until light and fluffy. Beat in the vanilla extract, then beat in the eggs, one at a time. Using a large spoon, carefully fold in the melted chocolate mixture. Sift the flours, gluten-free baking powder and xanthan gum into the mixture and fold in. Make sure the mixture is well mixed but take care not to overmix it. Evenly divide the mixture into the cake tins and level the surfaces with the back of a spoon. Bake for 35–40 minutes until firm to the touch and a skewer inserted in the centre comes out clean. Remove from the oven and leave to cool in the tins for 5 minutes, then turn out onto wire racks and leave to cool completely. Meanwhile, put the chocolate for the icing in a large heatproof bowl and rest it over a pan of gently simmering water, making sure that the bottom of the bowl does not touch the water. Heat, stirring occasionally, until the chocolate has melted. Put the blended nut cream and date mixture in a food processor or blender, add the melted chocolate and blend until well mixed. Put the cake on a plate and spread half of the icing over the top. Put the other cake on top, flat-side down, and spread the remaining icing over it. Decorate with the raspberries and serve.